AGUA VIVA is a dynamic young Cuban 4-5 piece band led by Jesus Cutino, one of the most vibrant figures in live Cuban music in the UK today. In a traditional Cuban quintet you will usually find a tres guitar, a bass, congas, vocals and a trumpet. In order to capture the romantic and exuberant spirit of a repertoire which features many Cuban favourites, including those songs made popular by the Buena Vista Social Club (Chan Chan, El Cuarto De Tula, Dos Gardenias to name a few) Jesus decided to replace the trumpet with a saxophone (Roberto Manzin). This is what makes AGUA VIVA so unique. The result? With a line-up of three of the most respected Cuban musicians in the UK and an incredibly talented Italian jazz saxophone player, AGUA VIVA offers a compelling and interesting mixture of traditional Cuban rhythms (such as son, cha-cha-cha, mambo or bolero), classic salsa and Latin jazz that sound timeless but utterly fresh. 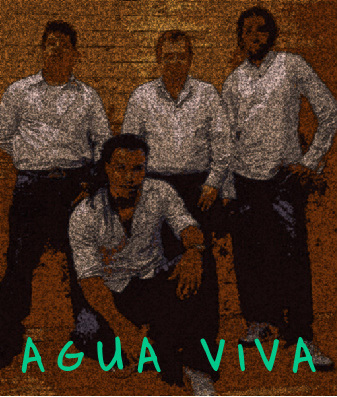 AGUA VIVA always succeed in transporting their audiences to the streets of Cuba. Copyright © 2008 Salsa Direct. All Rights Reserved.